Lock in a great price for Rocabella Santorini Resort & Spa – rated 9.1 by recent guests! The decor was everything! Boho minimalist with the best views I’ve seen. It was hard to decide on a hotel with all the choices, but look no further. Great for couples on a quieter part but you can still walk to places(if you don’t mind a longer walk). The cocktail bar pool was where we hung out all day and there is a free shuttle to Fira at night. Best hotel breakfast hands down. Can’t wait to come back! Everything else was fantastic. We were upgraded to a larger roo. With a front row view over the cliffs. Everything was very clean. The staff was helpful and charming. The facilities were very good and the location was superb! The sea view,the terrace jacuzzi,the excellent service from the stuff,the breakfast. The staff was extremely welcoming and accommodating to all of our needs. I liked that they offered to make reservations for us and to plan out our activities. They went over and beyond any customer service that i have experienced at any hotel. First of all, Thioni (the staff manager) was the absolute goddess of Rocabella Santorini. She’s extremely kind and helpful with everything, from the guide of the island features to the introduction to the facilities and our room. The hotel is beautiful. The view of the caldera is mesmerizing and amazing. I simply couldn’t believe what my eyes were telling me. The pools and restaurant were amazing. Every member of the staff was kind and happy. Staff made the experience amazing, special thanks to Maria. Staff was AMAZING!! Everyone who worked there went above and beyond. We really couldn't ask for any better service. Breakfast was lovely, and don't miss the French toast. Rocabella Santorini Resort & Spa This rating is a reflection of how the property compares to the industry standard when it comes to price, facilities and services available. It's based on a self-evaluation by the property. Use this rating to help choose your stay! Enjoying a scenic setting in Imerovigli, Santorini, Rocabella Resort combines traditional architecture with modern design. 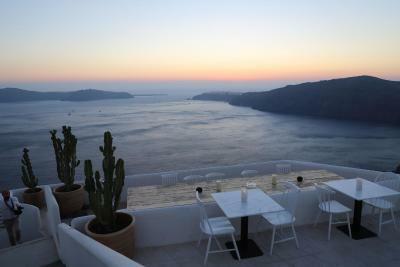 Boasting magnificent views over the caldera, it offers a pool, a wellness center and fine dining. Each accommodations is uniquely styled and appointed with contemporary furnishings and splashes of color. Facilities include a flat-screen TV, bathrobes and slippers. All rooms and suites have a private balcony, while some also feature an outdoor hot tub. Guests can start their day with a buffet breakfast including eggs, bacon, Greek products, yogurt and muesli, while a la carte breakfast is also available at extra charge. Guests can taste Mediterranean dishes at the poolside restaurant offering panoramic views over the caldera and the Aegean Sea. The Night Bar and the Pool Bar Lounge offer the ideal setting for an exotic cocktail with spectacular sunset views. The hotel’s spa provides sophisticated body treatments and includes a hot tub, hammam and sauna. There is also a state-of-the-art fitness center. 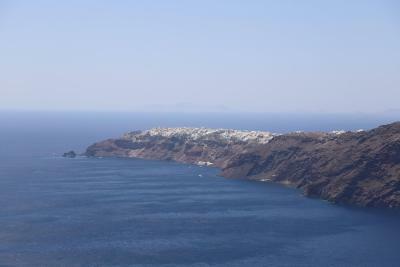 Fira, Santorini’s capital, is 0.9 mi away. Santorini Airport is within a 15-minute drive. The resort offers free on-site parking and free Internet access. 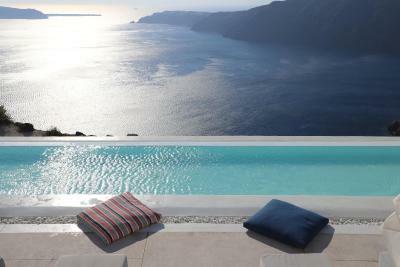 When would you like to stay at Rocabella Santorini Resort & Spa? This tastefully decorated, spacious twin/double room opens to a balcony with side sea views. The white-washed units combine the traditional aspects of Aegean with state of the art decor. This room features air conditioning, a mini-bar and a flat-screen TV. 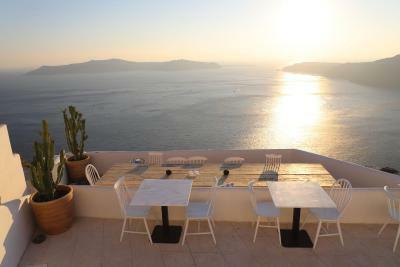 Combing traditional Aegean decoration with modern touches, this air-conditioned room overlooks Caldera views. A flat-screen TV with satellite channels is also offered. This quadruple room has a balcony, mini-bar and bathrobe. Please note that children and extra adults (3rd and 4th) can be accommodated at extra charge. Offering a private hot tub with Caldera views, this spacious and tastefully decorated room features a spacious bathroom with hydromassage shower and a flat-screen TV with satellite channels. 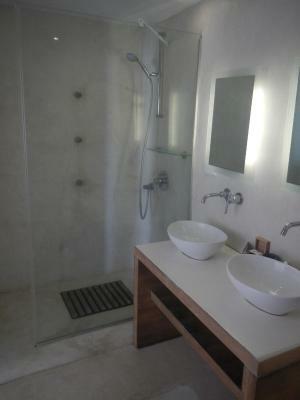 This suite opens to a balcony with Caldera views and features a spacious bathroom with hydromassage shower. 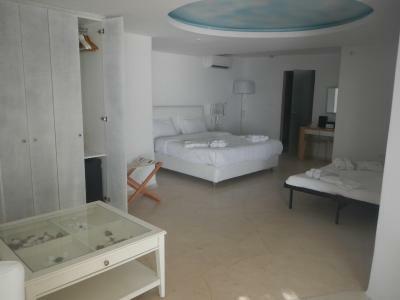 This deluxe room features Caldera views a spacious bathroom and an outdoor hot tub. 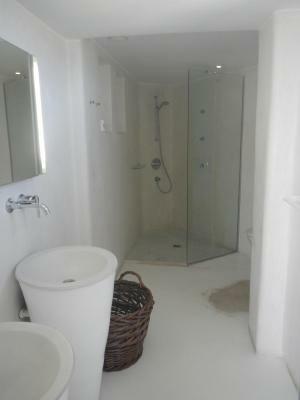 This suite features Caldera views and a spacious bathroom. 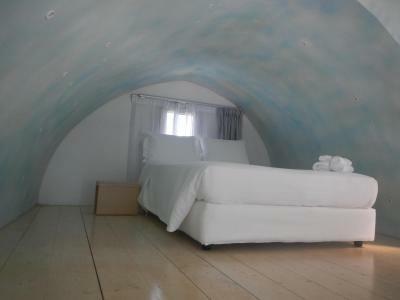 This quadruple room features a flat-screen TV, air conditioning and mini-bar. 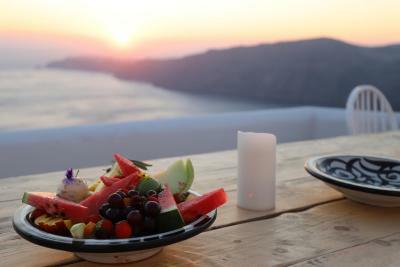 House Rules Rocabella Santorini Resort & Spa takes special requests – add in the next step! 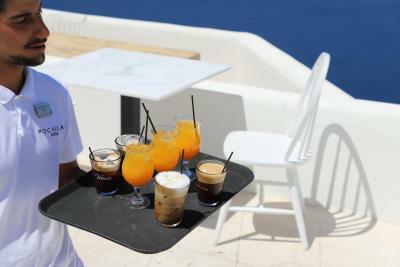 Rocabella Santorini Resort &amp; Spa accepts these cards and reserves the right to temporarily hold an amount prior to arrival. Rocabella Santorini Resort & Spa accepts these cards and reserves the right to temporarily hold an amount prior to arrival. On the first night we ate dinner at the restaurant at the hotel because we were tired from our journey and we wanted to fully enjoy the amazing view at sunset. Unfortunately, we discovered that the meal was extremely expensive, the portions were very small and the food was nothing special. Bad value for money. It is difficult to find criticism at such a wonderful resort. However I didn’t like getting a letter each of my 5 days that as there was a wedding that day we were unable to access all facilities. I understand the need for Rocabella to promote the location as an ideal wedding destination, I do not think it should be at the inconvenience of the regular visitor. All visitors are experiencing special days such as anniversaries etc. It’s why we choose to to stay. There is little doubt the major attraction is the location. Staff are very friendly. Rooms were maintained at high standard. The two bus drivers were excellent in their desire to assist visitors. Everything about Rocabella was outstanding- the facilities, the decor,the service. But the real icing on the cake were the staff. From the moment we were met at the airport to the point of our departure the staff were warm, friendly, informative and helpful. We are so pleased that we had the experience of staying in this truly beautiful place. The beds weren’t that comfortable.